There aren’t many more exciting places in the world than New York. It’s an enchanting city heaving with skyscrapers, bright lights, yellow taxi cabs and – most importantly – opportunities. Some seriously ambitious companies and some extremely bright minds gather together in the Big Apple to make things happen. What’s more, you couldn’t have picked a better time to think about heading over there. This year, the New York Post reported that the city’s economy is booming, enjoying its longest economic expansion in over 70 years. 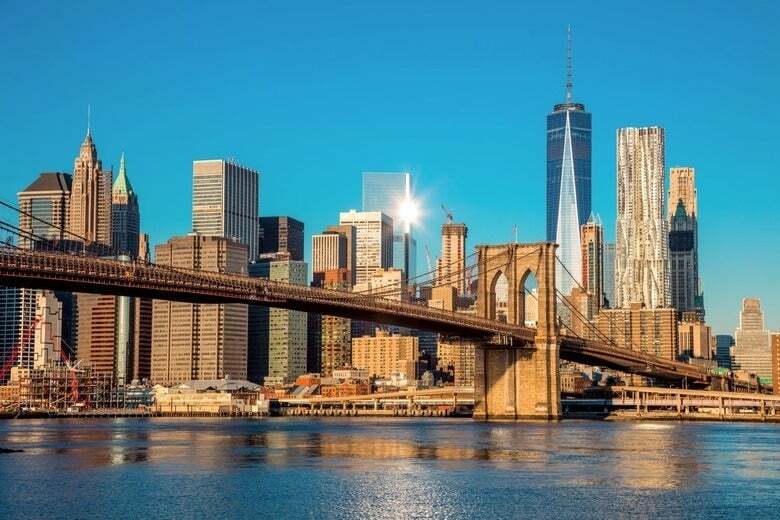 It’s also a welcoming place for expats; there are over 8.6 million people in New York City and over 37% of them were born in another country. We’re going to tell you all about what it’s like to work over there, including living costs, salaries, job hunting tips and key visa info. Enjoy! You can’t live in the City of Dreams without paying a premium for the privilege. New York City is famously pricey, offering very little bang for your buck (so it helps to have a lot of buck). 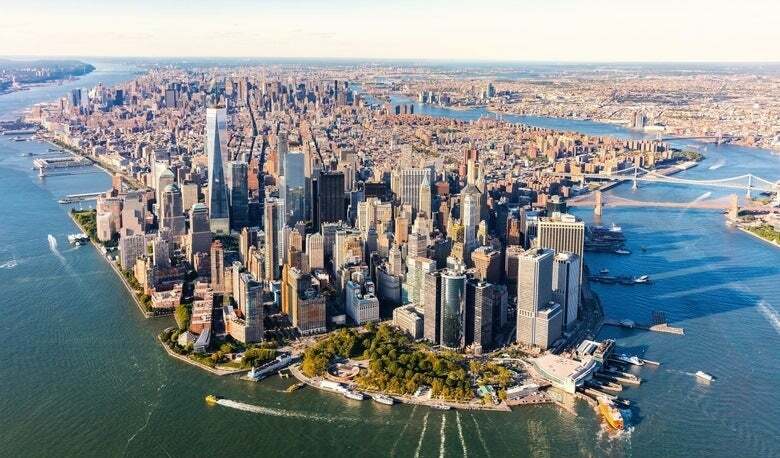 In the Council for Community and Economic Research’s (C2ER) 2018 Cost of Living Index, they analysed 308 urban areas in the United States and – surprise surprise – three districts of New York City placed in the top five. Manhattan, Brooklyn and Queens ranked first, second and fifth respectively. However, in global terms you could be doing much worse. In Mercer’s 2018 survey of the most expensive cities in the world, New York didn’t even make the top ten (it was 13th). If you’re interested, Hong Kong was first and four of the top five were in Asia. Plus, when it comes to buying property instead of renting it, New York is not the most expensive city in America; San Jose, San Francisco, San Diego and Los Angeles are all above the Big Apple (according to Curbed). As New York City’s living costs are so high, it makes sense that its average salary should also be above the national norm. In 2017, Forbes reported the average median base salary in the US to be $51,324 (or £39,069), while in New York City it was $60,606 (or £46,137). Nobody goes to New York to relax; the city is loud, fast-paced and intensely competitive. People go over there to make it big, and hard work is the best route. “Working late” is a fairly common occurrence and people tend to check their work emails at the weekend. On the sidewalks, daily commuters like to walk quickly, so it’s wise to speed up or get well out of the way. New York City’s “enthusiastic” work culture and its sprawling size goes some way in explaining these numbers. Basically, life in New York can get pretty tiring if you don’t look after yourself. It’s not surprising Central Park is so popular with the locals. Finding work in a faraway city used to be almost impossible, but the internet has made things so much easier. You can browse jobs from the other side of the world and stay sat down for the whole thing. The best resources for job hunting in New York City are the names you might expect; Indeed, Monster and Glassdoor all have excellent online NYC job boards. If you’re looking to join the American public sector, check out the New York City Government website. To make things a lot easier, the UK-US Visa Waiver Program gives Brits the right to a visa-free 90-day stay in the US. This means you’ve got time to get a better feel for the city, apply for jobs in person, visit careers fairs and (hopefully) attend interviews. The New York State website has a great online calendar for all the job-hunting events coming up in New York, such as resume workshops and motivational talks. For more information, check out our page on job hunting in the United States. New York is a “world city”, which is a fancy way of saying that it’s just really good at quite a lot of things. Finance, fashion, retail, healthcare, advertising, tourism: you name it, New York does it well. However, it does certain things better than others, so we’ve taken a closer look at what’s hot in New York right now. It’s very trendy nowadays for cities to be crazy about tech, so it’s no surprise that New York’s technology industry is absolutely banging. It all started out on a couple of blocks located around 23rd street, but in the past few years the city’s tech sector has spread all over the place. Between 2010 and 2016, the city’s average tech salary increased three times faster than the rest of NYC’s private sector. According to TechNYC.org, 83% of New York City’s tech companies intend to hire more people in 2018 than they did in 2017. If you want to ride the crest of an exciting new wave, hop on New York’s tech bandwagon. Bright, creative people are starting up new companies all over the world, and New York City is a particular hotspot. It’s got loads of shared office spaces, a stack of keen investors and countless networking events. The NYC “startup ecosystem” is worth a whopping $71 billion, which makes it the third most valuable on Earth. Polidea created a cool list of New York’s most exciting startups in 2018, which includes a seriously wide range of industries – it’s not all about tech. You’ll find companies like Hubble (healthcare delivery), Fatherly (parenting advice) and Away (suitcase manufacturers). Similarly, Inc’s list of New York’s fastest growing companies in 2018 offers a proper mixture, from the house-selling platform Compass to the luxury bedding company Brooklinen. Sometimes company culture is more important than status or salary. Maybe you’re more concerned about finding a nice place to work than just the highest-paying job available. In the fast-paced work environment of New York City, this is especially important. Earlier this year, a company called Great Place To Work surveyed over 33,000 employees in the Empire City. Then they published their results here, naming the best 25 places to work in New York City. Alongside corporate firms like Deloitte and T-Mobile there are also some fairly fun picks, such as Build-A-Bear Factory and The Cheesecake Factory Inc. You’re spoilt for choice in New York. Once you’ve got your heart set on NYC and you’ve found a company that want you, your last obstacle is the visa. There are several options open to you, which we explain a little bit here. Please note that the vast majority of work-based US visas rely on you having a job offer from a licensed American company before you move there. We’ve already mentioned the VWP. It’s a UK-US agreement that gives British visitors the right to stay in the States visa-free for up to 90 days. You can’t use the time for actual employment, but you can use it for job-hunting. What’s more, a 90-day stay in New York City will give you a proper taste of life there, and it’ll help you decide if that’s what you really want. H1-B Visa (Skilled Worker): for professionally qualified people, lasting for three years but can be extended to six. H2-B Visa (Skilled and Unskilled Workers): for people going to the States to perform seasonal work or fill a temporary labour shortage, lasting between one and three years. L-1 Visa (Intra-Company Transferee): for people moving to the States within the same company, lasting between five and seven years. You can see the full USCIS breakdown of employment-based non-immigrant visas here. These visas aren’t technically permanent, but you can pretty much extend them indefinitely if you keep meeting the requirements. They generally last for two-year periods before requiring a renewal. The US government releases around 140,000 employment-based immigrant visas every year, which sounds like an awful lot, but there’s normally a fairly long waiting list. E1 First Preference: People of “extraordinary ability”. E2 Second Preference: Professionals holding advanced degrees. E3 Third Preference: Professionals and other skilled workers with at least two years training/experience, or unskilled workers filling a shortage. Read more on the USCIS website about all the employment-based immigrant visas here. Also known as “The Green Card”, the Permanent Residence Card allows you to live in the United States indefinitely. Most people don’t manage to get one until they’ve spent at least a few years working in America on a temporary visa, so you probably don’t need to think about getting one just yet. However, if you want to know more then check out the USCIS page on green cards here. Hopefully this article has turned your New York dream into a genuine New York possibility. There’s a bit of work for you to do, especially when it comes to finding a proper job over there, but it will all be worth the effort. If you do seal the deal with a company in the Big Apple, we can help you move your belongings over there. Just fill in the form at the top of this page and our suppliers will get back to you with their best prices. For more info, check out our guide to international container shipping costs. Good luck, champ!